The topic of patient and family engagement is HOT right now. When I started this work ten years ago, the idea of involving patients and families at the organizational level in hospitals was new in Canada. A rare children’s hospital might have a Family Council, but that was about it. Now hospitals and researchers have awoken to the idea of talking to the people who they care for and serve. This super infographic about Family Engagement was co-written with Karen Copeland, a family leader in the child mental health realm, and founder of Champions for Community Wellness. 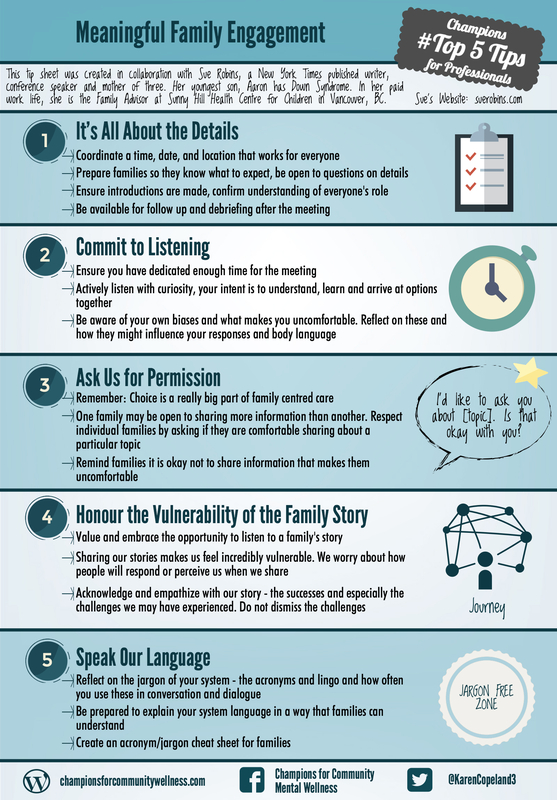 It is a solid summary for staff of what meaningful engagement looks like to families. Last night, I had the honour of attending Isabel Jordan’s talk about Patient Engagement at Evening Rounds in downtown Vancouver. As the mom of a child with a rare disease, Isabel had many great suggestions about meaningful engagement of patients and families. Her wisdom included suggestions about involving patients in conferences (via the Patients Included movement) and closing the circle after engagements. She emphasized that patient engagement is really about treating people with respect. Plain and simple. Last Sunday, the afternoon of the Canadian Family Advisory Network was spent talking about engaging families in pediatric research initiatives. This means involving families early on in the research, and shifting the mentality from families/children being research subjects to being research partners. This is a change in doing things TO or FOR patients & families to doing things WITH them. I think this movement starts at the bedside or point of care, and with acknowledging that patients and families bring their own expertise to health care settings. This means shedding the hierarchies that are rampant in health care, and for staff and physicians to stop hiding behind their professionalism and graduate degrees and to simply be human beings, plain & simple. It means treating people as you want to be treated yourself. It is about human connection. It is about person to person relationships. And this starts with listening. Listening to each other’s stories without rushing, without judgment, without defensiveness, and without assumptions. It is challenging work to be respectful listeners, because it means we have to examine our own values and understand where our own biases come from. It is only then we can really listen to patients and families and work with them as true, equal partners in care. If this sounds too soft, here’s a more practical article that was published in the Health Issues Journal in Australia called: Meaningful Engagement or Tokenism. Here, I open with a story about what tokenism in engagement looks like. Then, I move onto practical solutions that includes ideas about: scheduling meetings, preparing patients/families, welcoming people, flattening hierarchies, creative outreach and feedback loops. Engagement is really about treating people like human beings – with respect & dignity and as equals to you. There is no magic or secret sauce here. Patient and family engagement is about doing unto others as you would have them do unto you. Thank you for this Sue. It is an honor connecting and creating opportunities with you! Another excellent article Sue. I have shared it with the Patient and Family Advisor Group here in Saskatchewan. I look forward to your digest emails each week.